Over 4 years have passed since I’ve posted my scoop on Matlab’s upcoming new graphics system (a.k.a. HG2, Handle Graphics version 2). At that time HG2 was still far from usable, but that has changed when I posted my HG2 update last year. Numerous user feedbacks, by email and blog comments, were reported and the MathWorks developers have listened and improved the code. 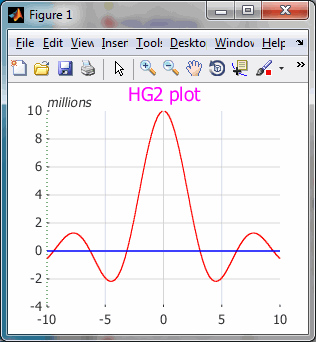 HG2 was finally released with Matlab R2014b last Friday, and it seems at first glance to be a beauty. I hope my posts and the feedbacks have contributed, but in any case the MathWorks dev group deserves big kudos for releasing a totally new system that provides important usability and aesthetic improvements [almost] without sacrificing performance or backward-compatibility. Trust me, it’s not an easy achievement. One of the nice things that I like about HG2 is that it provides numerous new ways to customize the objects in ways that were impossible (or nearly so) in the old HG1. In R2014b, the leap was large enough that MathWorks wisely chose to limit the official new properties to a bare minimum, for maximal HG1 compatibility. I assume that this will remain also in R2015a, which I expect to be a release devoted to bug fixing and stabilization rather than to new features. I expect the new features to start becoming official in R2015b onward. Such a measured roadmap is to be expected from a responsible engineering company such as MathWorks. So in fact there is no need at all to be disappointed at the relative lack of new functional features. They are all there already, just not yet official, and this is just as it should be. That being said, if we are aware of the risk that these features might change in the upcoming years until they become official (if ever), then we can start using them today. Experience with this blog has shown that the vast majority of such undocumented features remain working unchanged for years, and some of them eventually become documented. For example, uitab/uitabgroup, on which I posted over 4 years ago, and which has existed almost unchanged since 2005, finally became official in R2014b after many years of running in unofficial form. In the next few weeks I intend to present a series of posts that highlight some of the undocumented customizations in HG2. I’ll start with some new axes features, followed by plotting aspects. The ruler object itself has plenty of very useful hidden properties (getundoc again…). In R2014b the number of hidden properties for *ALL* objects has multiplied – many standard properties now have hidden internal mirror properties having the “_I” suffix. For example, Tick is a visible property, and Tick_I is hidden. But there are of course other properties that are hidden and are not such internal mirrors. Today I’ll focus on the ruler’s visible properties only. The result can be seen in the screenshot above. For Truecoloralpha, the fourth color value (255 in the example above) signifies the relative transparency: 0=transparent, 255=opaque, and values between 0-255 indicate the degree of translucency. Note that the default Axle.ColorData sometimes changes between [51 51 51 255] and [38 38 38 255], I’m not sure exactly when this happens. In some cases the YRuler may use ColorData=51 while XRuler uses 38 (which is slightly darker). This way we can force the exponent to always have a certain value, or to always display engineering values (multiples of 3). We can do this by attaching a listener to the corresponding axes’ limits, e.g. YLim for the Y-axes. Go ahead – play around with the new HG2. It’s a lot of fun and quite painless with the new object.property notation. If you have any feedback on the features above or any other, please do share them in a comment below. I’m quite sure that MathWorks will read these comments and this may be a way for you to influence the features that may someday become officially supported. More to the point, make your graphics become even more stunning then they have already become with out-of-the-box HG2! The HG2 customization series will continue next week with a discussion of additional new axes properties, including Baseline, BoxFrame and GridHandle. At least on my system plotting huge data sets (scatter) is very slow. The plot comes up fairly quick, however the control is not returned to the command line. Afterwards is zooming also very slow. Of course, one should check the amount of data, before plotting it, however in HG1 this could be done rather quickly. Try updating your graphics drivers, the new graphics system uses hardware acceleration more so I think it’s more sensitive to such things than the old system. I updated mine and the graphics speed noticeably improved. Perhaps related: Saving figures to disk (via the print command) also seems significantly slower. Elapsed time is 0.476110 seconds. Have you tried to update your display drivers? One change I noticed is that the area where the ButtonDownFcn is active has changed. In previous versions it was active where the axes was active and where the x and y tick labels are (and in the white space inbetween), where as now it is not active in the white space inbetween the tick marks. Then click (callback will run) where the x/y tick labels are (e.g on top of 0, 0.1, 0.2 …. 1.0) and then click in the space between them (callback will not run), in previous version (all the way back to at R13) clicking in between the labels also activated the ButtonDownFcn callback. I have used this callback for many years to zoom in/out and reset scaling interactively with the mouse. I would like to add my voice to the disappointment with HG2. Although it may be great from a programming perspective, it is significantly slower for me. Specifically, the scatter plot function performance is awful: it went from a 1.4 second elapsed time to a 22.6 elapsed time. My interactive program has become unusable. I have expressed my displeasure to the Mathworks, and although I found a sympathetic support engineer (who was able to reproduce the problem), all he could offer for help was the fact that he had informed the development team. If an upgrade destroys performance, it can hardly be called an improvement. @Matthew – is your 14b using hardware OpenGL? some HG2 performance issues are due to the fact that it uses more advanced OpenGL features than HG1, so what used to run at hardware-acceleration speed on 14a (HG1) may now run at much slower software speed in 14b (HG2). Upgrading the display driver sometimes helps. I discussed this last week. Of course, upgrading the driver is not an all-encompassing panacea. Performance issues have been an ongoing issue with HG2. I know for a fact that MathWorks are investing a lot of effort to improve this, but it might take another release or two for things to really settle down. As an alternative, try to improve the performance of your scatter plot by either plotting a vector of 100+ points (as odd as it may sound, scatter-plotting 80 points is slower than plotting 2×80=160 points! ), or use the low-level line function rather than scatter. YRuler is great, but it would be lots better if one could customize individual elements of arrays like YTickLabel, etc. For example, I often draw a horizontal line, add the height of the line to YTick, and give the tick a custom label. What I’d then like to do is highlight my added label with a different color, font, etc. But it doesn’t appear possible with the current setup. It seems like this would be a simple thing for matlab to add. Or is there some other undocumented way that I can do that already?? 2. In second pushbutton callback I use the ax = gca and set its position to make only one plot i.e at only one position. However, when I press pushbutton next time, it still retains the old Axis values although it replaces data from plot. It appears very cluttered. This happens every time I use the pushbutton. How can I clear the axes and set it fresh so that old axes and its values disappear ? I have already tried these options below but no use … it still shows the old axes labels/tick labels etc. @Vaishta – gca (=”get current axes”) only gets updated when you click or create an axes. If you want your button’s callback to refer to a specific axes, which may or may not be the currently-active axes, you should use not gca but the actual axes handle (the output of the axes function). Read the Matlab documentation for more information. Thank you for information. Can you tell how to implement it in pushbutton callback ? in the callback after the plot() function but its of no use … it still shows the old axes line, ticks and labels. @Vaishta – you have to read the Matlab documentation about how to create GUI callbacks and how to share data between GUI components/callbacks (https://www.mathworks.com/help/matlab/creating_guis/share-data-among-callbacks.html). In general, you need to store the axes handles in a location that is accessible to the callback function (for example, in the button’s UserData property). It looks like you’re using GUIDE to create your GUI, and in this case you could also access the axes handles via the handles structure. 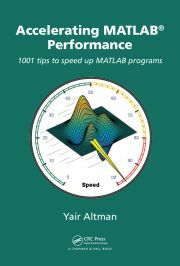 I’m afraid that all this is pretty basic Matlab GUI stuff, which is not the subject of this blog – this blog specializes on advanced aspects, I leave the basics to the Matlab documentation and other forums/blogs. If you’re still having problems with this, you could either post a question on the Matlab Answers forum, or contact me offline for a private consulting session.